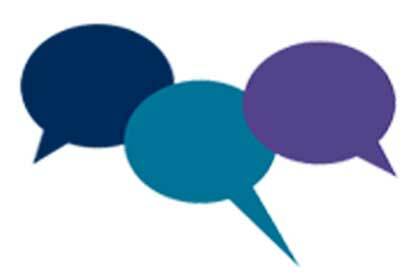 May is Speech and Hearing Awareness Month! Speech and Hearing Awareness month occurs annually in May and is a recognized event by the Government of Canada as part of their Calendar of Health promotion days. 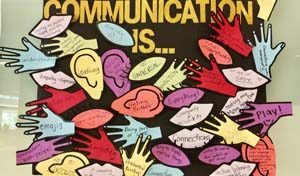 Each year, Speech-Language & Audiology Canada (SAC) dedicates the month of May to raising public awareness about communication health. Various organizations, students, faculty and health professionals also use this time to promote awareness about a wide variety of aspects related to the professions of speech-language pathology and audiology and shed light on critical issues that warrant public attention. The inaugural Ontario speech-language pathology (SLP) and audiology graduate student conference, “Theory to Therapy” was held on Saturday May 5th, 2018 here at 500 University Avenue. MHSc candidates and founding conference Co-Chairs Allie Annibale, Brianna Guild, Shanie Rampersaud expressed that they were absolutely thrilled to have started what they hope will be the beginning of an annual tradition of Ontario SLP and Audiology graduate student conferences. One day, they envision it as a rotating conference throughout the 5 Ontario SLP/Audiology universities, attracting students from programs in all Ontario programs. Doing so will allow students to share and grow together as they journey to become successful professionals. 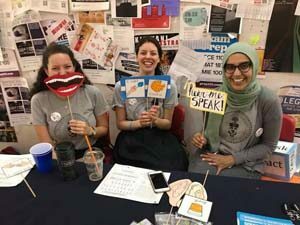 A group of Year 1 students launched Speech and Hearing Awareness Month with an event on May 11th in the form of an information booth (the first of three to be held this month). This first booth was set up at Holland Bloorview Kids Rehab and featured activities such as the “Communication is…” board and SAC word searches & colouring pages, as well as information pamphlets on SLP & Audiology. The students expressed that they were very happy with the amount of people (41 to be exact) that stopped by to engage with the group. The visitors ranged from children who took an interest in the colouring pages and stickers, to adults who shared stories about their children or others who had received services from a Speech Language Pathologist. Great launch everyone! 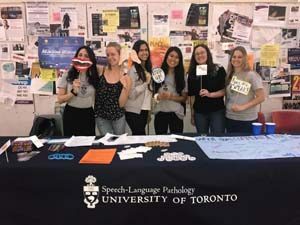 The students concluded the Speech and Hearing Awareness initiatives with two information booth events on May 17th and 24th at Sidney Smith Hall, the main Arts & Science building on campus at the University of Toronto. 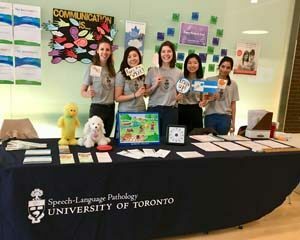 The booth featured activities such as the “What does communication mean to you?” board, as well as information pamphlets on University of Toronto MHSc SLP program, and the professions of SLP & Audiology. 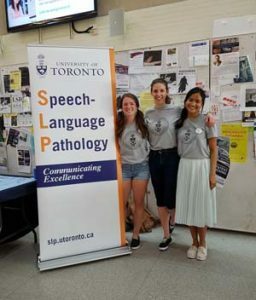 The booths at Sid Smith were visited by many University of Toronto faculty and students, including prospective SLP students who were able to talk to the current Year 1 students about the program. Passersby were educated about the importance of early detection and intervention in the treatment of communication disorders, and the role of SLPs & Audiologists within an interdisciplinary team promoting communication health. This year for Speech and Hearing Awareness Month we launched REAL IMPACT: Strengthening SLP Community through Collaboration. Several lectures were organized under the umbrella of Research Wednesdays along with a very well attended Public Event. Presenters from inside and outside the department participated. Early in the month clinicians Jennifer Barker, Lisa Durkin, and Erin Yeates, from UHN presented a lecture titled From Practice to Research and Back Again: Treating Oropharyngeal Dysphagia Jenny is a speech-language pathologist in the Peter Munk Cardiac Centre at the University Health Network. She manages swallowing and communication disorders in patients with cardiac and vascular disease. She holds a status-only appointment in the Department of Speech-Pathology, University of Toronto. Lisa is Practice Leader for Speech-Language Pathology at Toronto General Hospital and Princess Margaret Cancer Centre at the Unviersity Health Network. She holds a status-only appointment in the Department of Speech-Pathology, University of Toronto. Her current area of practice is Head and Neck Cancer and Erin Yeates is a speech-language pathologist at Toronto Western Hospital in the Outpatient Swallowing Clinic and across various acute care wards, including medicine, stroke and ICU. She is a graduate of the University of Toronto SLP program. Associate Professor Alice Eriks-Brophy, presented a lecture titled Revealing the Role of Culture in Classroom, Clinical and Community Interactions: An SLP Focus. Alice has been teaching courses in the department of speech-language pathology on aural rehabilitation, articulation and phonological disorders since 2002. Her research focuses on the contributions of society, culture, and context to descriptions and perceptions of communication impairment, along with the theoretical and clinical impact of these variables on assessment and intervention in pediatric speech-language pathology. Her research interests build on her experiences as an itinerant teacher and an early intervention specialist working with children with hearing loss, as well as over thirty years of experience as a classroom teacher, consultant, and researcher working with Indigenous communities in Canada. Margit Pukonen the Interim Executive Director at The Speech and Stuttering Institute presented The Ontario Preschool Motor Speech Training & Research Project: The Power of Collaboration Margit is also an Adjunct Lecturer (status – only) with the Department of Speech – Language Pathology. She has been a front line clinician, managed the clinical programs at Speech and Stuttering Institute and has overseen the development and evaluation of new treatment and professional training programs for children with motor speech disorders. She has been involved in research studies and coauthored publications on the subject. She also has extensive experience running and developing group therapy programs and professional training workshops. Dr. Regina Jokel presented a public lecture titled Is Losing Your Words a Sign of Losing Your Mind? Language in Healthy Aging and Dementia. Dr. Jokel is an alumna of the University of Toronto and a member of its faculty. She is an assistant professor in the Department of Speech Language Pathology and a scientist at Rotman Research Institute, where she conducts research on preventing language decline in aging, identifying signs of dementia in spoken and written language and designing novel interventions to fight language loss in dementia. She is well known to the public for her contribution to the analysis of Agatha Christie’s writing suggestive of the author’s dementia in her late life. This notion was called one of the 10 ideas of the year 2011 by the New York Times Magazine. Dr. Jokel has published and presented extensively all over the world on language in dementia. She was awarded the Age Plus prize by the Canadian Institutes of Health Research for her published work in the field of aging. Recently, she has been nominated for the prestigious Weston Brain Institute Outstanding Achievement Award for her work on language interventions in dementia and was awarded the Distinguished Service Award from the University of Toronto Alumni Association. Highlights included, useful strategies for word finding! And finally to cap off the months lectures Dr. Elizabeth Rochon presented the lecture Intense or Not Intense: Challenges for Aphasia Therapy. Elizabeth is a Professor with the Department of Speech-Language Pathology and a Senior Scientist and member of the Communication Research Team at Toronto Rehab. Dr. Rochon is also an Associate Member of the Heart and Stroke Foundation Canadian Partnership for Stroke Recovery. Dr. Rochon’s research and teaching interests relate to the theory, assessment and treatment of aphasia, dementia and related disorders. Research interests lie in identifying the nature and components of linguistic and cognitive impairments subsequent to brain damage, and in developing new treatment approaches for language impairments in aphasia. In addition, she is interested in language processes in normal aging.